At 0900 hours on 5 December, 1969, Capt. Benjamin Danielson and Lt. Woodrow Bergeron departed Cam Ranh Bay in South Vietnam for a mission in Central Laos. Their McDonnell Douglas F-4C Phantom fighter, serial number 63-7444, call-sign "Boxer-22", was the number two aircraft in the flight. 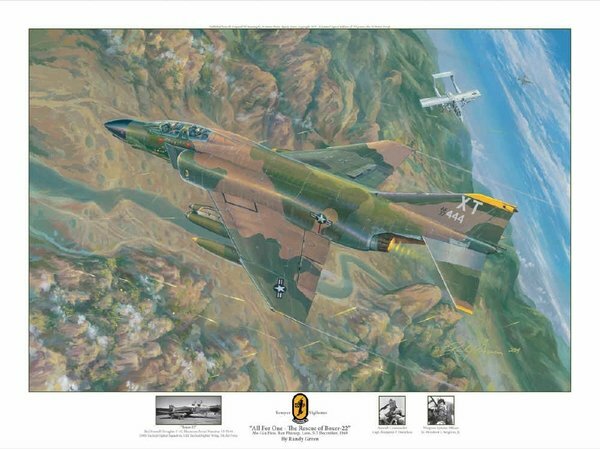 The lead aircraft, another F-4C with the call-sign "Boxer-21", was piloted by Maj. Joseph Young. Their mission, to drop MK-36 anti-personnel mines along the Ho-Chi-Minh Trail, was altered after failed contact with the Forward Air Controller (FAC). They were then diverted northward to a trail-target near Ban Phanop, 20 miles south of the Mu-Gia Pass in Laos, a notorious entry-point to the Trail from Northern Vietnam. Their mission progressed as briefed and the two Phantoms arrived in the assigned target area without incident. The flight then came under the control of a FAC, call-sign "Nail", orbiting in a OV-10 Bronco. "Boxer-21" was cleared in first and dropped his mines successfully on the trail. After observing "Boxer-21's" strike, "Nail" cleared in "Boxer-22". Capt. Danielson initiated a steep dive on his target and released his ordinance. Immediately after his drop the aircraft was hit hard by AAA fire and pitched into an uncontrollable state. Within seconds the crew ejected from the Phantom directly over the target area. The aircraft continued earthward until it impacted on the karst valley in a fireball 2,600 feet away. Capt. Danielson contacted "Boxer-21" and informed them that he and Lt. Bergeron were both in good shape. Search and Recovery (SAR) efforts were immediately initiated. About 35 minutes later SAR aircraft arrived and began a full-scale recovery effort. Capt. Danielson'sposition was revealed to the North Vietnamese after he had deployed a smoke marker for the first rescue helicopter. The Communists opened a withering fire, driving the severely damaged helicopter away. Six subsequent attempts to extract the men by the SAR teams. Each time, the helicopter was hit by ground fire and had to abandon its rescue effort. At 1848 hrs the rescue efforts on the first day were officially suspended. On December 6th, rescue efforts for the second day commenced at 0600 hours. At 0700, Lt. Bergeron reported hearing excited voices across the river, followed by a burst of automatic weapons fire and a scream from the pilot. Lt. Bergeron was unable to effect any further communication with Capt. Danielson and presumed him dead or captured. The valley was bombed and strafed for over five hours while Lt. Bergeron remained hidden in a bamboo thicket. All further pickup attempts were unsuccessful and rescue efforts ceased at dusk. On December 7th at 0850 hours, rescue attempts commenced. This time "Sandy-1", the on-scene commander, ordered the area sanitized with smoke, 20mm, CBU-30s, and heavy ordnance for three hours. By 1140 hrs, twenty-two A-1 Skyraiders circled the Nam Ngo River valley to protect the Jolly Green JG-77 helicopter and suppress the blistering enemy anti-aircraft fire. As the Jolly began its descent on the east side of the river, Lt. Bergeron dashed out as the helicopter lowered a rescue collar which he rapidly grabbed and was successfully hoisted aboard. Having eluded capture for over 50 hours and after 16 failed rescue efforts, Bergeron found himself en-route to Nakhon Phanom Air Base in Thailand. The entire SAR mission of 5-7 December would eventually become the largest rescue effort ever launched by the USAF, with some 336 sorties. Known in USAF annuals simply as "Boxer-22", the 51-hour ordeal resulted in five A-1 Skyraiders receiving heavy damage, and five of the ten HH-53 Super Jolly's sustained so much damage by ground fire that they were later scrapped.